The 4K UHD Blu-ray format is not only proving to be very popular with the consumer, it’s also a new tent pole for the long term survival of optical discs and the Blu-ray format. With the incredible vibrance and clarity of both the picture and sound quality, consumers are flocking to pick up the latest movie titles in 4K UHD. The movie studios are all too happy to push new and old titles alike in this new format due to the limitations of bandwidth for streaming. Given that cameras and smart phones are both capable of recording 4K UHD content, it’s not only the major Hollywood studios that can utilize the incredible impact of the 4K UHD format, but so can nearly anyone with a camera and a vision. Vinpower can help facilitate that vision with the ability to duplicate the 4K content and implement 4K UHD copy protection through our duplicator hardware offerings. 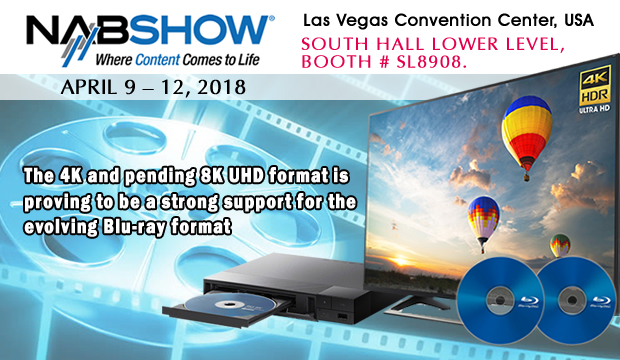 Check out Vinpower’s 4K UHD duplication and copy protection offerings and much more at the NAB trade show April 9th – 12th, at the Las Vegas Convention Center, South Hall Lower Level, booth # SL8908. For more details about any of Vinpower’s products, services, or support, visit our website: www.vinpowerdigital.com or speak with a representative near you.